Who coined the term “mocktail” anyway? Well, it just so happens that I bumped into an article from a 1983 issue of American Speech where the answer was to be found (please don’t ask how I seemed to be randomly browsing such an esoteric journal). 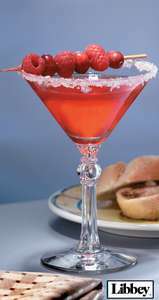 Philip Kolin says: The coinage mocktail appears for the first time, I believe, in an advertisement for Libbey Glass in Food Service Marketing (Feb. 1979, p. 76). According to that ad, mocktails “are a relatively new group of beverages prepared without any alcohol whatsoever.” Kolin comments that the ad was for a new line of mocktail glassware (I had no idea that glassware was so specialized – perhaps because most of mine was purchased at Ikea). He further states, clearly with the air of someone who loves language: Mocktail is a clever invention. It humorously rhymes with cocktail, but has a semantically appropriate first syllable. Mocktails are literally mock cocktails, with the sense of mock in mock chicken or mock turtle soup. The -tail of the second syllable of mocktail, however, has acquired a new meaning-that of the unshortened (and unadulterated) cocktail. Just a little etymology to start your week. Kolin, P.C. (1983). Mocktails, Anyone? American Speech, 58(2): 190-191.